Craft your own lantern… Many camping lanterns shine too bright. It’s plain and simple. The goal is to keep your camp site well lit but you’ll probably want to dim the light a bit as time goes by. Well, there is a cool trick that will do just that. Take your gallon jug and a head lamp, strap the lamp to the jug and voila! You have a nice makeshift lantern that will fill the entire tent with ambient light. Scary stories will sound so much better when you have this kind of lighting. You’ll be surprised how cool this light is when everyone’s quiet listening to a scary story or just thinking about life during the night. Proper gear… Probably the most important thing you’ll want to do is make sure that you’re well-equipped. So, do some research and figure out what to bring based on how much room you have and how long you are going to stay. A sleeping bag, tent, portable cooler, camping stove, flashlight and toilet paper are just some of the essentials that you need to pack. However, it all comes down to your personal preferences. Some like to hike to the campsite so packing too much stuff could be a problem in that situation. Just to be sure, check out your local camping shop or even better, visit a good camping shop online. When you see what they offer, you’ll realize what you need. Louder speaker… If you decide to camp with your friends, it’s obvious that you guys might want to listen to a song or two during your stay. And if no one has a Bluetooth speaker or anything similar to that, there is one cool hack that can make your smartphone speaker louder. Spare yourself the trouble of bringing big speakers and whatnot and bring your ceramic mug instead. A phone or an iPod will produce louder sound when placed inside a mug. You can try that at home if you don’t believe this. Bring sage… It’s easier to bring sage than to buy mosquito nets and then install them on your tent. Some of those nets don’t even work and if you tear them somehow, all of the bugs will get in. So, throw some sage on the hot coals every now and then and you’ll keep the bugs away. Sage is a natural insect repellent because of the smell. You won’t regret bringing it. Taco-In-A-Bag… This trick is becoming more and more popular lately because it’s so simple. If you don’t want to bother yourself with cooking while camping, this is a trick for you. Camping meals don’t have to be complicated at all and here is the proof. Buy a bag of Doritos chips, some lettuce, cheese, sauce and Taco-seasoned hamburger meat. Cook the meat, season it, throw in the veggies and mix the rest of the ingredients. Do this at home and then bring it to the camp. And there you go, you now have a proper meal. Know how to pack a cooler… The more space you conserve, the better. So, when packing a cooler, you should do this. 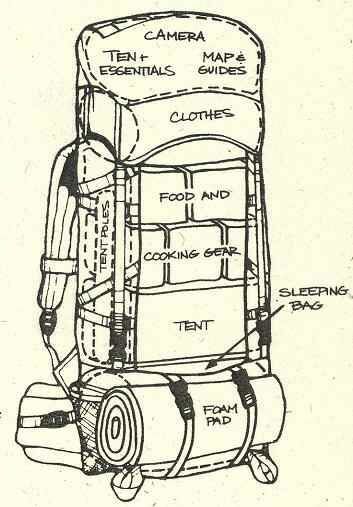 Know how to pack a backpack… Again, be smart when it comes to packing a backpack too. These tips will help you get more out of the camping experience. Take them into consideration and you won’t regret it.